STONE, Lucy (1818-1893) was a prominent U.S. orator, abolitionist, and suffragist, and a vocal advocate and organizer promoting rights for women. 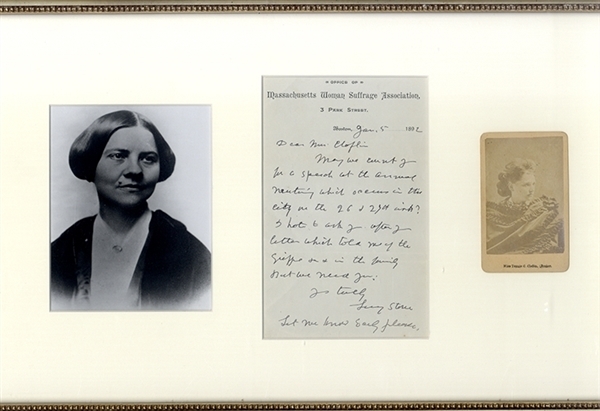 In 1847, Stone became the first woman from Massachusetts to earn a college degree. She spoke out for women's rights and against slavery at a time when women were discouraged and prevented from public speaking. Stone was known for using her birth name after marriage, the custom at the time being for women to take their husband's surname. Tennessee Celeste Claflin (1844-1923), also known as Tennie C., was an American suffragist best known as the first woman, along with her sister Victoria Woodhull, to open a Wall Street brokerage firm, which occurred in 1870.